Freshman pitcher Olivia Bowen throws a pitch during Saturday’s game against Skidmore College. 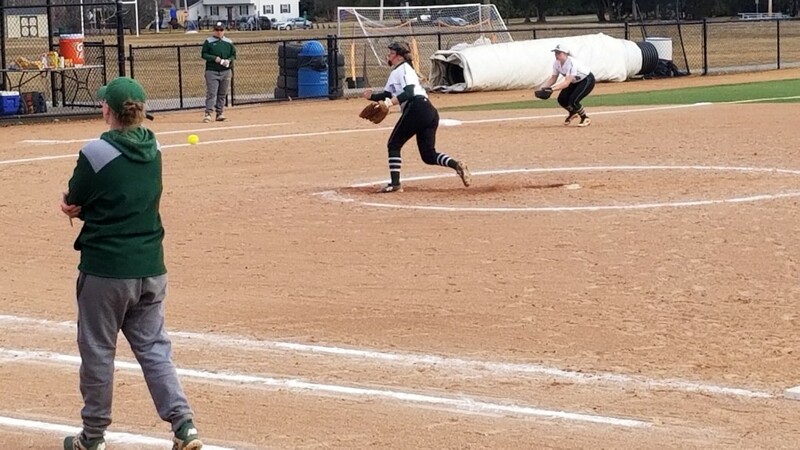 The Spartans softball team snapped a six-game losing streak Saturday afternoon after taking the first game of their doubleheader versus Skidmore despite falling behind early. Castleton missed chances, like when Kylie Wright tripled to lead off the third but was stranded on third and then leaving another runner on third the very next inning. But down two runs after five innings, the Spartans exploded for seven runs in the bottom half of the fifth inning. Freshmen Miranda Fish and Kate Lapin both drove in two runs for the Spartans during the big inning. With four hits on the day, Fish says she’s not looking for the extra base hits but just wats to get on base. On the mound, freshmen Kylie Wright had another solid game, giving up only two runs in a complete game shutout. “She’s our ace,” said head coach Eric Ramey when asked about her performance. Despite the game being at Skidmore, Castleton was the home game because the location was changed due to field conditions not being ready at Castleton. But as good as the Spartans felt about the first game of the doubleheader, in game two the bats would not come alive and they were held to only three hits in the game. A bright spot was freshmen Olivia Bowen, who had a solid outing in the circle going five innings giving up only two runs on three hits. “I think it was my best game of the year so far in the circle,” she said after the game, a comment echoed by Ramey. Ramey said he started seven freshmen in game two, which left him without the services of a couple of the veteran players. With Calli Van Gorden out for personal reasons and Tori Swaine out with a bad ankle, Ramey said he wanted to give them both some rest despite them playing in the first game. “We wanted to get some of the other girls some action in game 2,” Ramey said. Castleton was scheduled to play two home games this week but due to poor field conditions at Castleton, those games will likely be postponed. “I really wish our field was ready,” said freshmen catcher Jamie Boyle. The Spartans will spend spring break on the road as they will face off against Southern Main, Keene State, and Colby College.